One of Ana Portela’s variably veiled works. After Fran O’Neill asked me to give a talk about my artwork and curatorial practices at the New York Studio School several weeks ago, I had the honor of being invited back to spend an afternoon doing ‘open critique’ studio visits with a number of students whose bodies of work are distinct and diverse from one another in terms of materials employed and formal approaches alike. 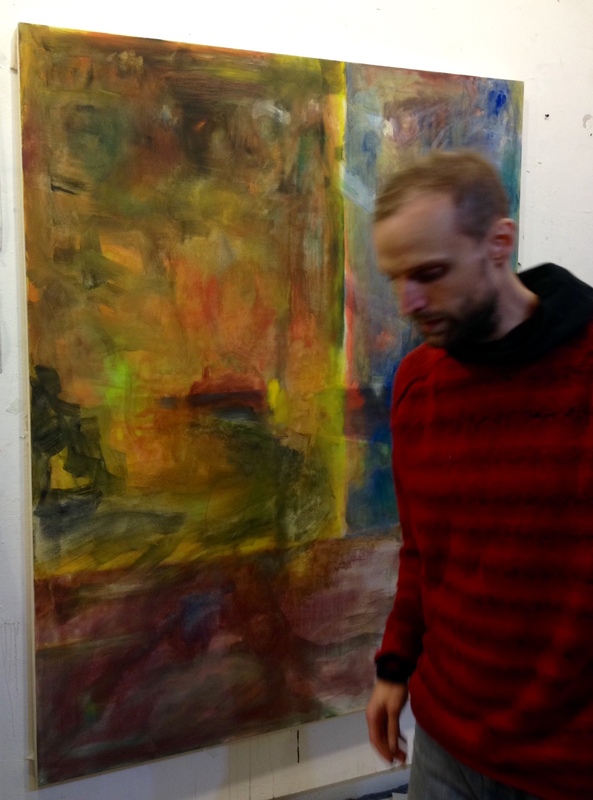 Here are some images of studios and works that I had a chance to look at and ponder, accompanied by some observations I put together in longer ponderings thereafter. 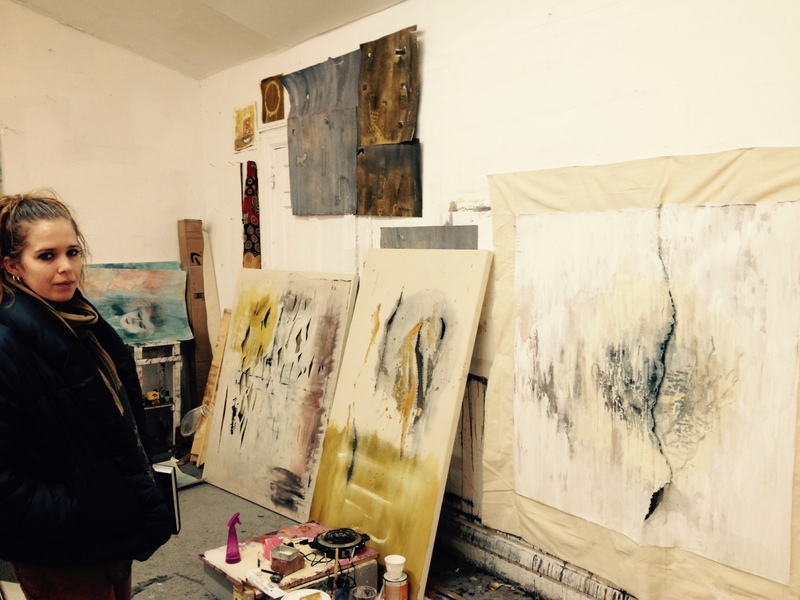 Katelynn Mills in her studio with some recent works. 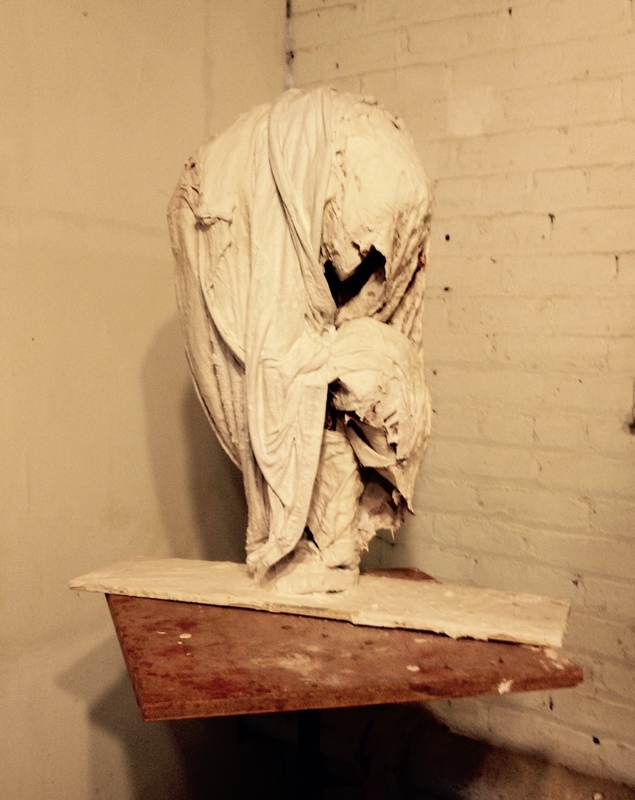 Perhaps more of a canvas-bound interventionist than merely a painter, Katelynn Mills makes visceral, very literally manually executed pieces that are matters of wounding and healing, tearing open and concealing, nurturing and suturing. 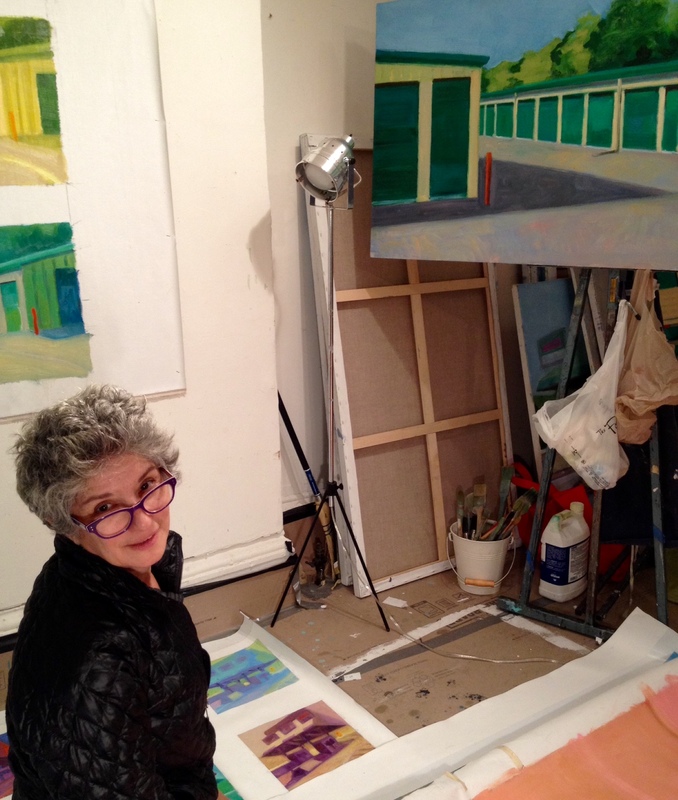 Adrianne Lobel in her studio. 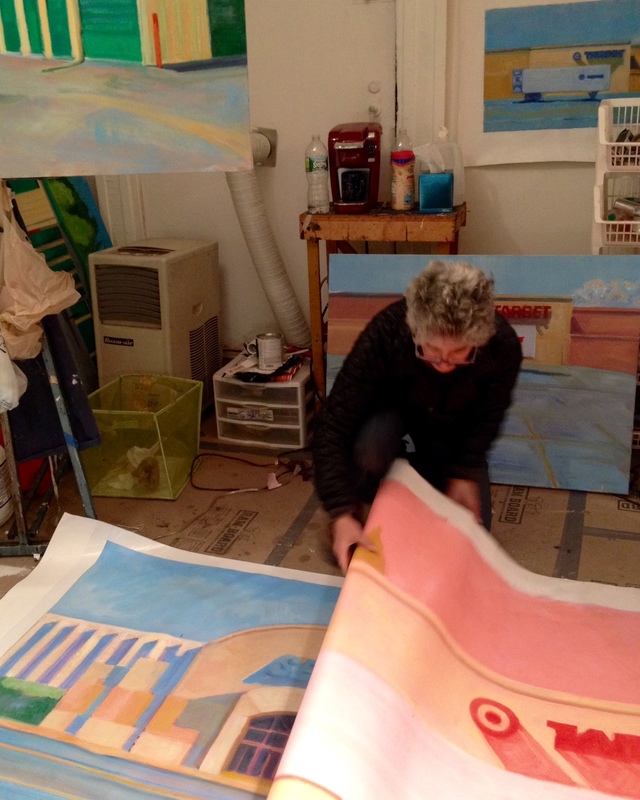 Adrianne Lobel, in her variably scaled renderings of empty parking lots, lone delivery trucks and desolate storage facilities, creates compositions full of exuberant light and quiet charm out of what one might otherwise regard as perhaps rather overlookable suburban mundanities. Their loss, Lobel would indubitably maintain—and her gain. Ana Portela, the only artist I met with working primarily in sculpture—though she’s also been tinkering with a series of drawings turning her sculpted three dimensions back into two—cloaks figure-like yet mysteriously vague forms with multi-media overlays splayed out in classically indicative, momentarily marble-suggestive furls and folds, at once veiling her subjects and subjectifying her veils. 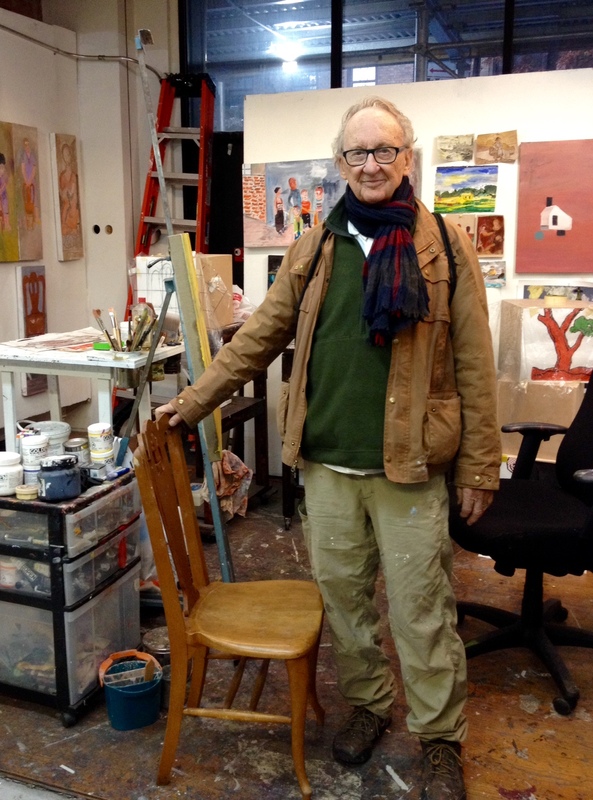 Jack King in his studio—with his ‘new’ muse. 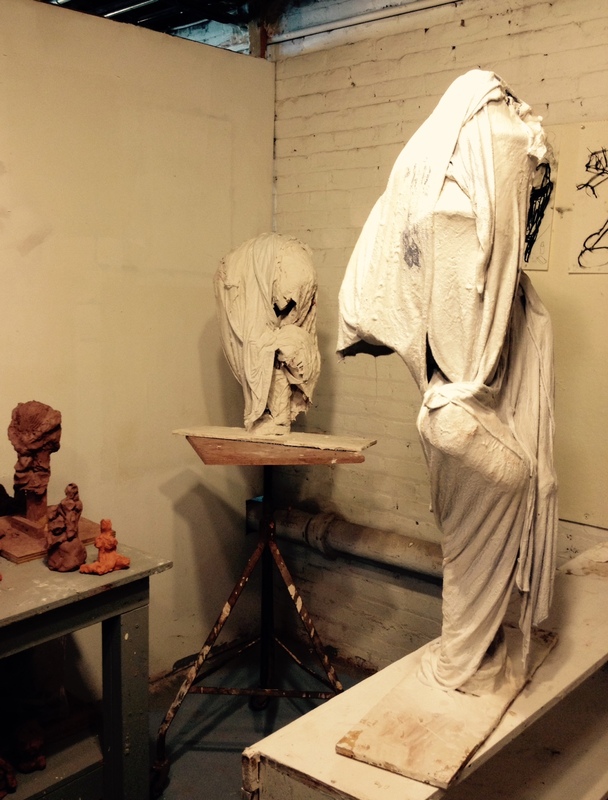 In their shared studio space, Jack King and Darrell Hostvedt work through and against prior careers and professional practices in very different yet equally effective ways. King, inspired by photographic images—sometimes his own—and impressionistically informed palettes, taps into memories and emotions in a way that now channels, now challenges certain convictions he had honed and intoned during his long academic career in psychiatry. What’s more, he has also recently located his true artistic muse in an old wooden chair that has become a synecdochic embodiment not only of his grandmother, to whom the chair once belonged, but also of a vast trove of associations and memories through which he can pick for depictions. Hostvedt, meanwhile, after working in construction for many years, now finds himself peering further and further into detailed segments of a particular landscape to extract its constituent forms, thereby deconstructing a certain glimpse of natural objects to then render them back into larger compositions in watercolor—at times building back onto them with reconstructive, collaged additions. 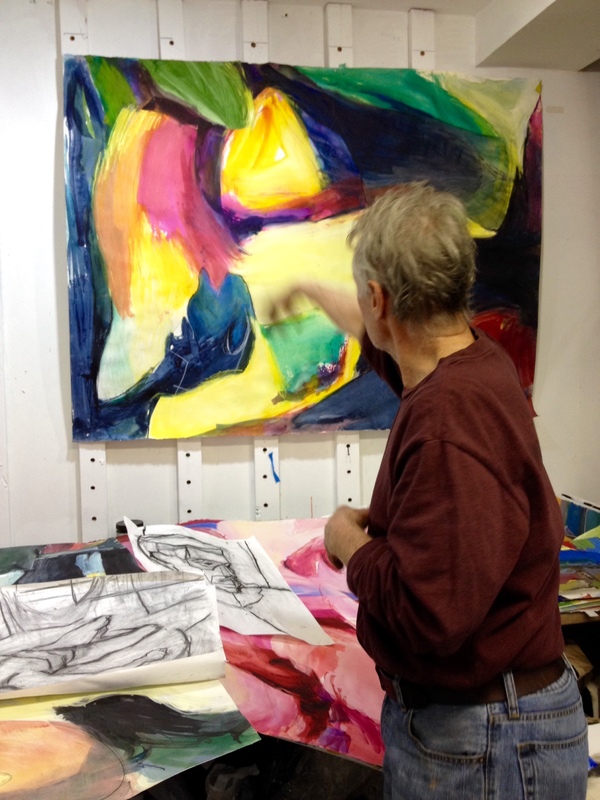 Darrell Hostvedt with a recent work. 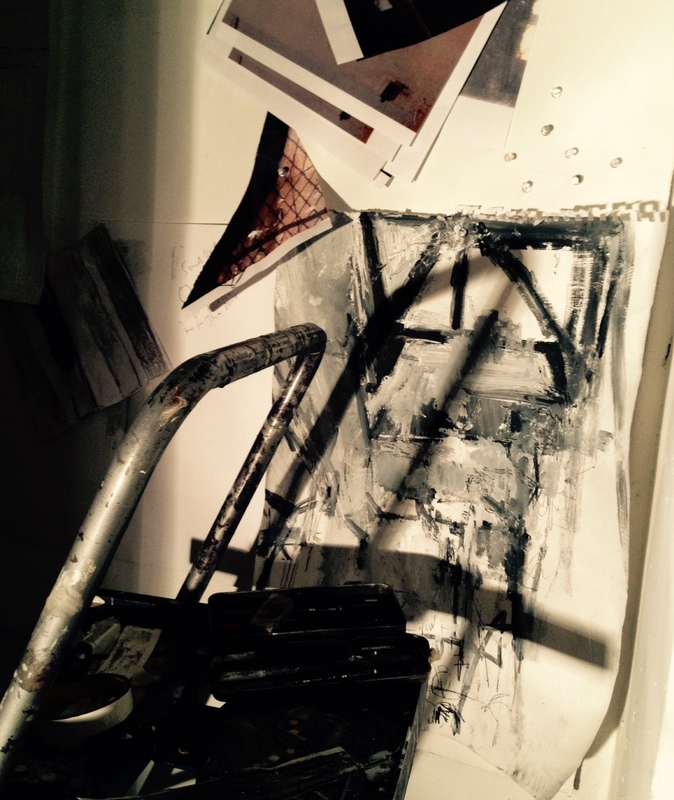 A glimpse inside one of the nooks in Jacobs’s studio. Laura Jacobs, finding herself quite literally overwhelmed with spatially charged inputs and insights upon moving into her quaint, quirky, warmly lit and brilliantly many-windowed studio—a most peculiar cranny within the New York Studio School dubbed Guston’s Kitchen, for reasons that are likely quite clear—traces, molds, reiterates and re-renders her deeply curious surroundings like an archaeologist, an archivist, a narrative-seeking dramaturge in the midst of an ever-shifting stage. While Jacobs used to work in set design, it seems she’s now situated such that a certain set seeks to design itself into her work. Finally, Stephen Walsh, a painter and draughtsman who knows well the challenges of harnessing abundant light and formal beauties from time spent in Italy, makes his most successful paintings when he is able to work against his own skills in drawing, in a way, such as in his recent treatment of the biblical narrative of the Annunciation, a work that’s quite readily audible in its silent splendor—and thus splendidly fitting for its spiritual context. Stephen Walsh passing before his treatment of the Annunciation.